Oh la la and omg. This looks like something I'd really dig having. How does the drive sound? Perfectly clear, punchy, very tight and responsive, a touch mid forward but i dont mind that. drive is really crunchy, super biter and doesnt chop low end. half way between a b7k and an old school driven tube amp. Very cool sounding. PaulS, DiMarco, jester and 1 other person like this. The Omnicabsim is literally the missing piece of the puzzle ffo guys trying to get their sound straight from pedalboard to FOH. My pedal board straight into full range speaker\PA system was too harsh and didn't sound right. The OCSD set the correct way sounds perfect. It's a great tweakable analogue tool. Preach brother! total must have for any DI pedalboard rig. Cool. Just ordered me one of those Trace Elliot Transit B pre-amps. Checked some recent Youtube vids on it and it definitely does have that Trace sound to it. Peavey are doing a great job with the Trace stuff recently tbh! youll be happy you did, its a killer pedal. I just picked up a barefaced big baby2 over the weekend. Hell yeah this cab is amazing! 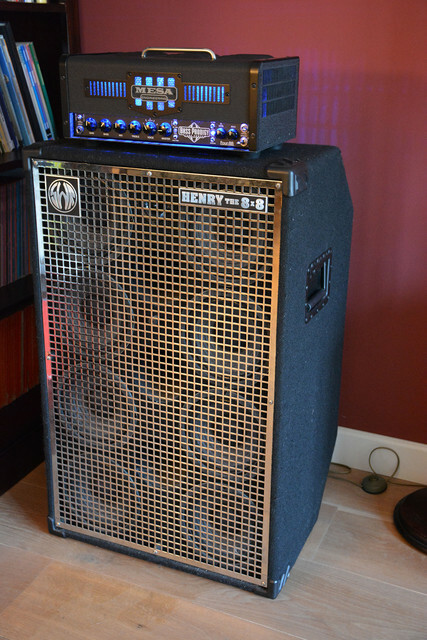 Mesa amp sounds so damn good with the Henry cab I am strongly considering keeping that amp. Warwick is ultra growly though this stack. I do not know why but apparently this amp is pretty picky about its cabs, but only when using it in the "active basses" mode. With passives it does not seem picky at all Oh well... I guess designing amps is a thing. The Trace sounds awesome with any bass through any cab but needs checking after. Its humming and hissing is becoming more noticeable lately. Bummer. I think the problem is in the pre section, between the jack input and the 12band EQ. I am hoping it is simply a bad pot. Might be something more serious though, there's also a pair of 12AX7 tubes and other shizzle between input and EQ. Argh. VT500 ampeggifies anything you throw at it. Sounds big and badass through a small cab. And finally there's the PJB combo for living room semi unplugged gigs, which has two inputs and eq sections and can also amplify vocals/guitar if needed. I had a feeling about hte Mesa+Henry. Me too. Tone is SO clear and tight. It REALLY brings out the growliness of the Dolphin and the uber punchy character of the Sonus. So now I got two full tube stacks which both sound really really good. The Trace Elliot + Barefaced can go stupid loud. Not sure if the Henry can do this too. Probably not. Anyway here's some hi-res eyecandy. The Henry cab is brand spanking new as you can see here. The average room would indeed sink with this gear. Just added a second big baby cab to my all valve markbass rig. Between this and my hellborg system I'm well sorted. Just need to find another band to gig with ha ha. Did you get the Barefaced cabs local? Can't believe the Steinberger hasn't sold btw, cheap as chips bro. Yeah and my other hellborg cab. Basically giving it away. Oh well. Might take them down for a while. Maybe just bad timing. Yeah I got the barefaced cabs locally second hand. CliffHNZ and RIP like this. One is enough for me. I could be tempted by a L2 fretless.